The great thing about Guillermo del Toro–what makes him so endlessly interesting as a writer and as a director–is that he never forgot what it’s like to be a kid. He’s got all these years of filmmaking experience and accumulated knowledge on a vast array of obscure subject matter, nestled alongside the uninhibited creativity of a precocious child. I can’t decide if that sounds insulting or not, implying that a grown man has a kid brain, but I’m sticking with it. There’s just no other way to describe it. Nearly everyone has an amazing mind as a child, and it’s only after years of exposure to words like “impossible” that those parts of the brain die off and we resign ourselves to the mundane. Del Toro somehow held on against all odds, and like Billy Batson and Captain Marvel now enjoys a full and equal creative partnership with his inner child. 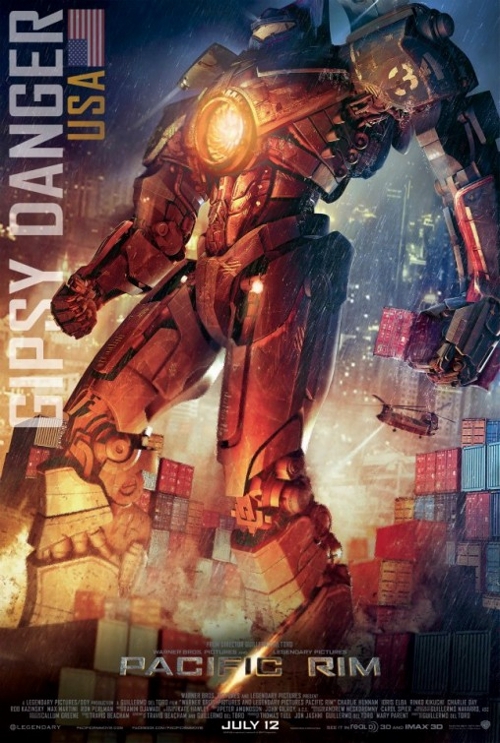 Pacific Rim is the latest fruit of that unique work ethic, a wholly unironic film about giant robots punching giant monsters for the survival of mankind. And I want to you to know that I’m being completely serious when I say that it’s pretty much a masterpiece. I don’t have cable, and I probably never will, at least under the current business model. As much as I’d love to have access to HBO, AMC, and maybe three other channels, I’m just not willing to pony up that kind of cash for the privilege of accessing several dozen reality TV and sports channels alongside those precious few I’d actually watch. I wait out the seasons and buy discs instead–so many discs–and like many others in this brave new era of cable-cutting I also rely heavily on streaming services. It used to be I could get by on just Netflix, but my insatiable hunger for films and quality cable dramas soon saw Amazon Prime and Hulu Plus added to my list. Even so, it all comes to under $30 a month and I assure you I get my money’s worth. Each app feels like it serves a special purpose, and I enjoy a wide variety of current and classic entertainment. Like all good things though, it’s all coming to an end.